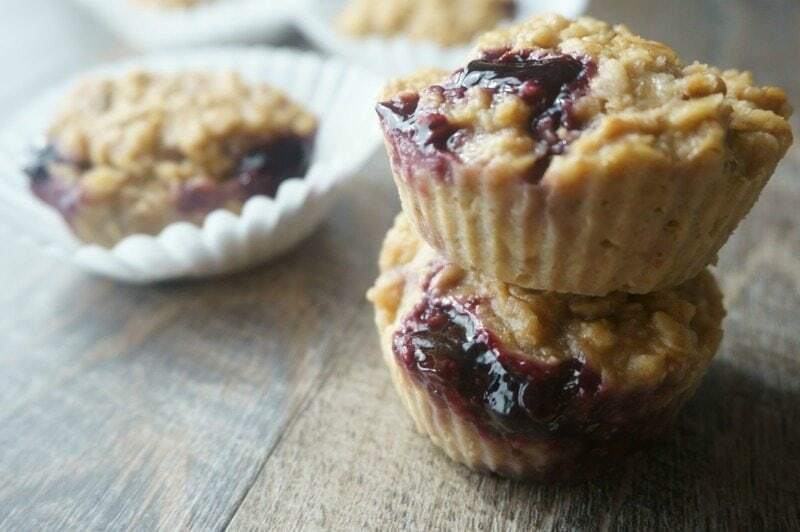 Gluten Free Peanut Butter and Jelly Muffins: A childhood classic in a gluten-free muffin form. Perfect for on the go and packing for lunches. Peanut free version included. I love peanut butter and jelly. I mean who doesn’t love a good old-fashioned PB and J?! I do not care to eat it everyday, but there is something about the combination of peanut butter with sweet jelly that makes it purely satisfying for me. Probably because it reminds me of my childhood or maybe because I simply adore peanut butter in just about any shape or form–and for the record I DO eat peanut butter every day–whether in a chocolate peanut butter cup, a peanut butter smoothie, or just on a spoon! Thankfully for me, my entire family LOVES peanut butter and jelly, so we resort to the classic sandwich for a quick lunch often. But OUR favorite way to enjoy PB & J is in Peanut Butter and Jelly Muffins. A tender, naturally sweetened peanut butter muffin, packed with a pocket of warm jelly. Truly a bit of heaven and SO much better than a traditonal sandwich. Not to mention this is a gluten-free version of peanut butter and jelly. Plus these healthy peanut butter muffins freeze perfectly–making them just as easy (but tastier) to have on hand than Uncrustables. In fact my daughter calls them our verison of DIY Uncrustables. Add in a whisked egg, some vanilla, milk, oats, flax seed for extra nutrients, and a big dose of peanut butter. Fill muffin tins 1/2 of the way with the batter. Add a teaspoon of all fruit jelly to the peanut butter muffin. Cover with jelly with another small scoop of muffin batter. Bake the muffins until they are set. Freeze muffins on baking sheet until solid–about 1 hour. Place into freezer bag and freeze for up to 3 months. Reheat muffin by placing in microwave for 45 seconds or by placing in fridge night before serving. The texture of these easy oatmeal muffins is more like baked oatmeal than a fluffy muffin. They are dense, hearty, and oh so good. 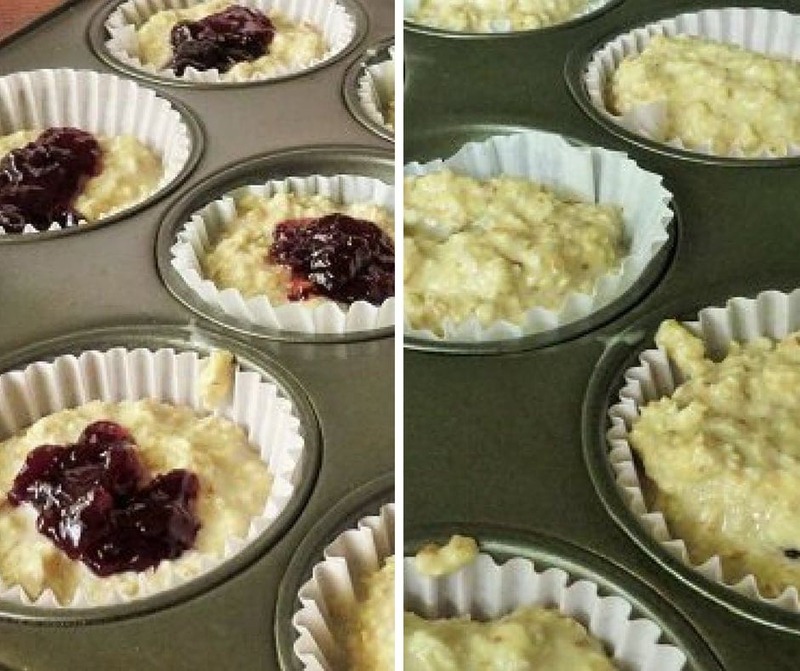 You can use any jelly you like in these gluten free oatmeal muffins. I love using my Strawberry Chia Jam at times in place of my go-to Blackberry jam. I use old-fashioned oats in these Peanut Butter Oatmeal Muffins, but quick-cooking oats work as well. Be sure to use Certified Gluten free oats if making gluten free. To keep these muffins dairy free, use almond milk, coconut milk, soy milk, etc. Use almond butter or sunflower seed butter in place of peanut butter for peanut free version of peanut butter and jelly. Use silcone muffin tin or silcone cupcake liners for ease non-stick. A delicious gluten free recipe for peanut butter and jelly muffins. These easy oatmeal muffins make the perfect snack or meal on the run. Preheat oven to 350 degrees and line a 12 cup muffin tin with liners. Mash the bananas with the applesauce and the peanut butter. Stir in the egg, vanilla, milk and flax seed until well combined. Add the oats and stir until all the ingredients are fully incorporated. Fill each cupcake liner about 1/2 the way full of oatmeal mixture. Dollop one teaspoon of jelly on each muffin and top with 1-2 tablespoon remaining batter on each muffin--just enough to cover the jelly. Bake for 25 minutes. Cool slightly and enjoy! I really enjoy jelly & pb. I hope you enjoy them Rach!! These muffins will be a great grab and go muffin for the busy summer life. Thanks so much for sharing this great recipe with Full Plate Thursday and come back soon! Thanks Miz Helen. We just grabbed tg see muffins from the freezer yesterday for a quick lunch out and about. Such a fun recipe! I agree, pb&j never gets old! These sound divine. I could eat peanut butter and jelly almost every day. I certainly can eat PB & J daily. Thanks! This looks like a fun recipe to make with my kids for breakfast! THey love all things PBJ! I cannot get my daughter to eat oatmeal, but she loves muffins. I need to see if I can get her to eat it like this. Keeping my fingers crossed!! I hope she loves them Kristen. That jelly on the top may do the trick! Ohmygosh I could eat about forty of these! Such a great muffin combo! Thanks Jenn! I have certainly eaten my fair share! I love PB&J muffins, and I make a similar one. And I’m not going to lie….I could eat a PB&J sandwich every.single.day. These are perfect for back to school. My kids are always grabbing something as they head out the door. PB&J to the rescue!! Yes, PB&J saves the day! Hi! Have you tried making these with steel cut oats? I have some great quick cook steel cut oats I’m curious to try in other recipes! Thanks for the great recipe! Hmm, I have never tried these with quick Steel Cut Oats, but I be they would work. You may need to add 1/4 cup extra liquid. If you give it a try and let me know how it works out! Girl, I would eat a PB&J every single darn day, but sadly I don’t let myself. My kids would devour these muffins! these sound fantastic – love this combination! I love peanut butter and jelly too! These individual baked oatmeals are awesome! I couldn’t choke down a pb&j sandwich, but a muffin is another story! These sound so yummy! Liz, I love PB&J sandwiches, so I can not relate. But hopefully this muffin would be something you would like. Great make ahead of time recipe for the kids on a road trip or in general. Love it! !